I started and have been participating in my own drawing challenge, #MightCouldDrawToday, for the past 6 weeks. I’ve drawn every day, and was on a roll for 5 straight weeks. I felt like I was nailing it each day and my drawings were getting better and better. And then, I hit week 6. Once I reflected back and realized this—and realized it was continuing to happen—I decided to think about it a little bit more. Why did my attitude this week change? Was I in a creative funk? How did I get into this creative funk? Why am I unhappy with these drawings? What was going through my mind while I made these drawings, that was different than before? Above all, I just wanted to get out of this funk, and get back to making art that makes me happy. After some thinking and writing, I realized the problem: I had let my creative tank crash. I’d been pushing, pushing, pushing in every direction for weeks, firing on all cylinders and I hit the wall. I’d been working long hours, not giving myself time to recoup or relax properly, and expecting to keep it up for months. I used up everything in my tank and was sputtering around still trying to fuel up my work with nothing in there. All those things were feeding into each other, creating a pretty nasty negative feedback loop. Each negative thought was leading to the next, and I was going deeper and deeper into a self-critical spiral. I was unhappy while I was drawing, so I created unhappy drawings. I was in a creative funk. So now I know the problem, and I know it’s a problem a lot of us have often. It’s definitely happened to me before, and I’m sure it will happen to me again. So once we recognize we’re in a creative funk, what do we do? 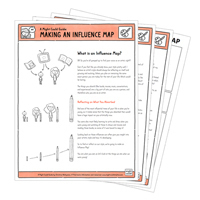 How do we get out of this creative rut? How do we get back to making the art we love and being happy while we create? I’ve got 4 steps for ya. 1. Remember that creativity ebbs and flows. Let’s be blunt: you won’t always be on your A-game. You’re going to have good days and bad days, good weeks and bad weeks. It’s ok. This is all a natural part of the creative process. It happens to everyone. Trust in the creative process and trust that this ebb is just temporary. 2. Write or draw about your funk. So you feel poopy. You feel gross. You feel like you can’t make anything good at all. Use that! Draw or write about those feelings. Try to think deep and feel deep and get it all out on the page. I like to write about the issues I’m having (hello, I’m doing it right now! ), because it lets me think through them. I also like to draw about them as a sort of pressure valve release, letting all that frustration out of my mind. In the end, I almost always feel better, and have a path to go forward, a new way of thinking, or just a lighter head. Sometimes funks come on out of nowhere, and all of a sudden we feel like a big, fat slug. We don’t have energy, we don’t have creative juices, and everything just turns out blah. What about this: Instead of moaning and groaning about being in a funk and beating yourself up about it—like I was—try embracing it! Most likely, you feel sluggish because you need time to recharge and fill up your tank. So take a break, and give yourself some you-time. Watch a movie, read a book, take a bath, close your eyes and lay down in the sun. Be a slug. Embrace the slug. 4. Think good thoughts + get outta the Negaverse. 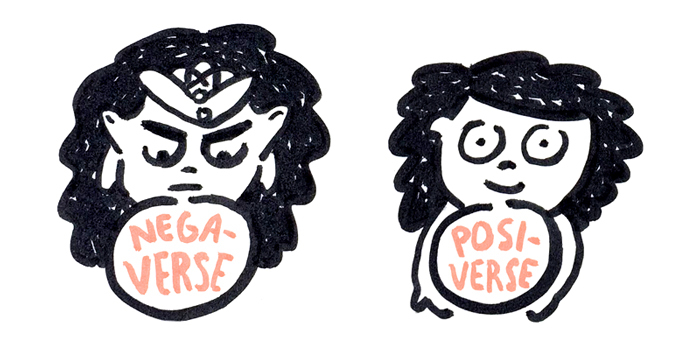 When we’re in a creative funk, we tend to get stuck in a negativity loop, aka the Negaverse (Sailor Moon, anyone?). In my funk, I had unknowingly convinced myself that because the last few drawings I made were terrible, the next few were bound to be terrible. And lo and behold, I’d finally sit down to draw and it would be… terrible. My bad thoughts were reinforced, and so the loop would continue on and on. This negativity was stopping me from being able to get in the zone and the creative flow with my art. I was just going through the motions and not feeling anything. These negative thoughts were making me dread sitting down draw, instead of being excited and happy about it like usual. 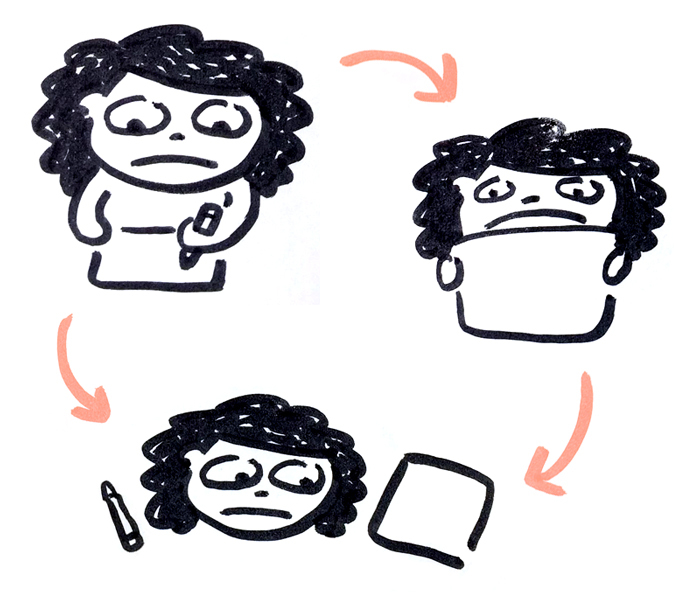 Eventually I realized I was in this negative loop, and was then able to bat away these negative thoughts. Every time a negative thought would pop up, I would try to replace it with a good thought. It feels silly at first, but it really does start to work. We have to remind ourselves that we are artists, we have created art we loved before, and we will create art we love again. Just because we make a few not-so-great drawings, doesn’t mean we’ll be not-so-great forever. And really, what was so wrong with those “bad” drawings? There’s bound to be something kind-of-good about them! We can’t make our art from a place of negativity, bitterness, and self-criticism. We have to actively try to stay in a positive mindset, and treat ourselves and our work with love and kindness. This is hard when we’re in a funk, I know. Last week I got myself so wound up and stressed and anxious about my art that stress and anxiety became the problem. I turned what could have been a small little dip, into something bigger. I was the one standing in the way of me and my art. I was this ball of nervous energy, trying to draw peppy food art, and it just wasn’t happening. 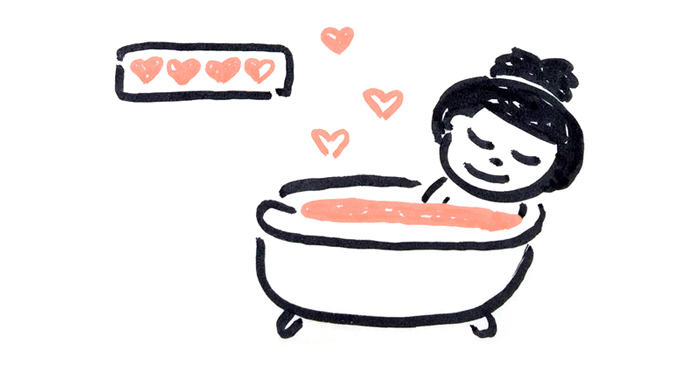 We’ve got to get out of this anxious mindset and relax to be able to get in the flow and make the art we love again. Do what you need to relax. Take a break from drawing if you need to, but only a day or two! Trust in yourself. Trust in your art. Remind yourself of art you’ve done that you’re proud of. Try to relax and unwind. You’ll be out of this lil’ funk and back to your art before you know it. Love this post, I get in funks all the time and needed this to remind myself (again) that it’s ok to be in a creative funk and take a break! Thank you for sharing. Yes to all of this! I’ve definitely experienced my fair share of funks and I’ve realized that the best thing I can do for myself is just let it be. It’s so easy to get sucked into the “negaverse” otherwise! This hits so deep with me. I’m exactly in the creative funk right now – so deep, that even though I used to love drawing so much, now I associate it with anxiety unfortunately. I think the “embrace your slug” is probably the most underrated advice xD makes so much sense!